There's nothing quite as sweet as a perfectly frosted sugar cookie. Sugar cookies decorated beautifully with royal icing and so pretty you can barely manage to take a bite. Eh. Totally overrated! I want to eat my sugar cookies and not feel guilty about ruining a work of art. So I usually just slap on some frosting and call it good. I'm a huge fan of cream cheese frosting. The cream cheese adds just a little tart to emphasize the sweetness. The trick, in my opinion, is the almond extract. That just kicks the frosting up a notch. I usually eat cream cheese frosting on carrot cake, but it goes great on these vanilla sugar cookies, too. 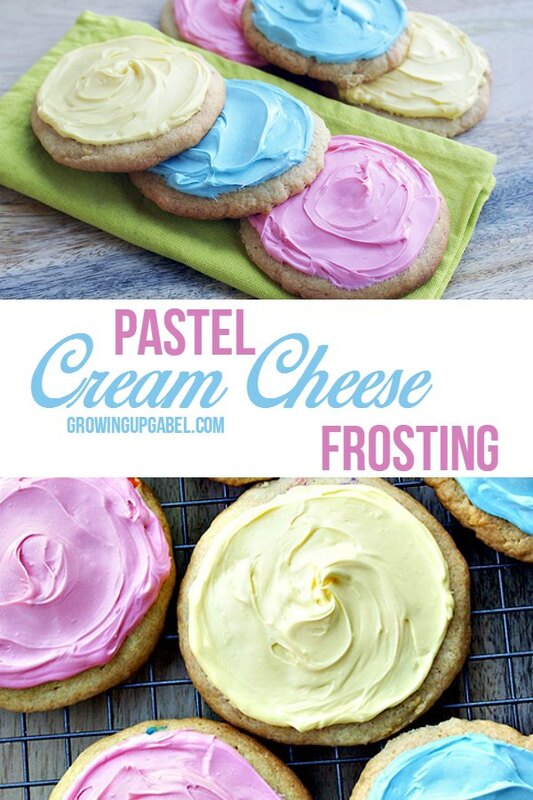 You can dye the frosting any color you like. These are pastel because it's spring. But just keep the frosting white and add sprinkles, too. in a medium sized bowl, add cream cheese, butter, and almond extract. Mix with blender until combined well. With your handheld blender on low, slowly add in 1 cup of sugar. Add in milk, and continue to blend. Finish adding in the rest of the sugar. Once done, divide icing into 3 different bowls. To make the 3 different colors, add 3 drops of food coloring to each bowl accordingly. (1 bowl for red, 1 bowl for yellow, and 1 bowl for blue). Mix each bowl of colored icing until food color is mixed evenly throughout. If you want a lighter color, reduce the amount of food coloring by one drop. So, each bowl would get two drops of the coordinating food color. Once the cookies have completely cooled, you may add the icing and enjoy!